MEUCE Conversations on Europe: "Before there was Ebola: European Responses to diseases in Africa - Past and Present"
U.S. and European news coverage of the Ebola outbreak in West Africa highlighted the urgency of the public health crisis, focusing often on the need to contain the outbreak to prevent its spread to “our shores.” Implicit (and often explicit) in these stories, however, were long-standing xenophobic and racialized attitudes toward African diseases that can be traced back to European imperial and pseudo-scientific ideas of the nineteenth century. 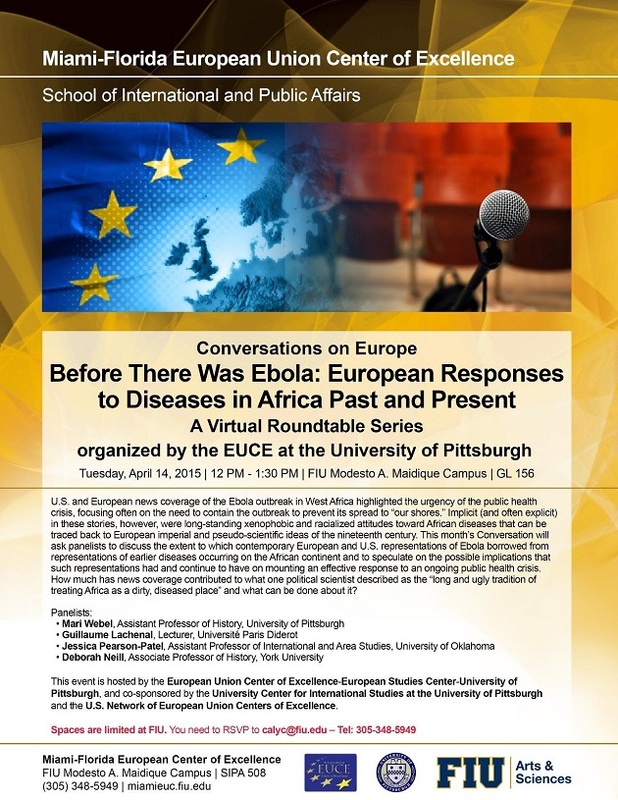 This month’s Conversation will ask historians, political scientists, and public health experts to discuss the extent to which contemporary European and U.S. representations of Ebola borrowed from representations of earlier diseases occurring on the African continent and to speculate on the possible implications that such representations had and continue to have on mounting an effective response to an ongoing public health crisis. How much has news coverage contributed to what one political scientist described as the “long and ugly tradition of treating Africa as a dirty, diseased place” and what can be done about it?